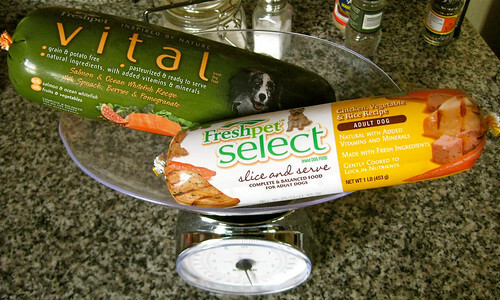 Our first encounter with Deli Fresh/Freshpet products was several years ago, by chance. 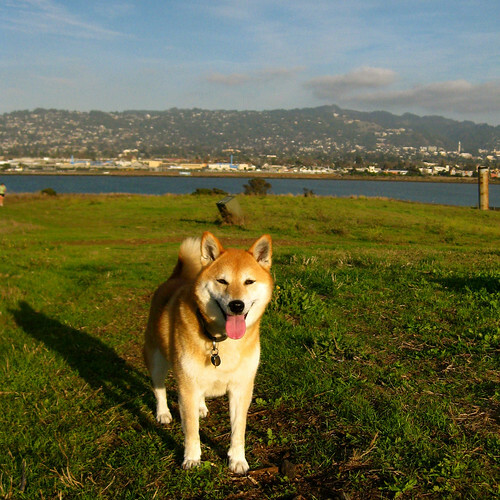 I was with Bowdu at the off-leash dog park, proceeding towards the exit when all of the sudden, he jerked his head around as if his muzzle was tugged by a string, and he headed immediately towards a stranger in the near vicinity. Paw up on the stranger’s thigh, he was shamelessly mooching for something tucked into the man’s palm. “Sorry about that!” I called after him, trotting over to fetch my dog and embarrassed by his lack of manners. “What is it?” I checked. 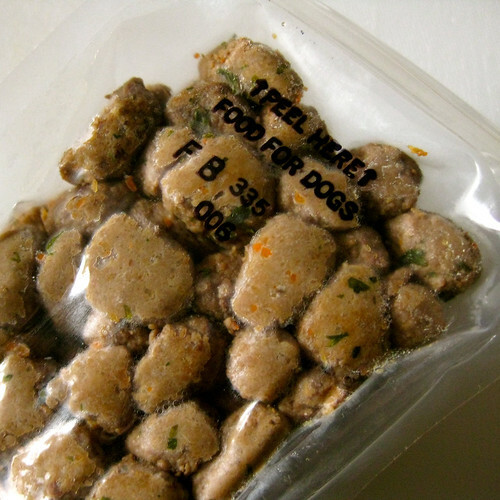 “It’s refrigerated dog food, from the special case at the pet store,” he said. 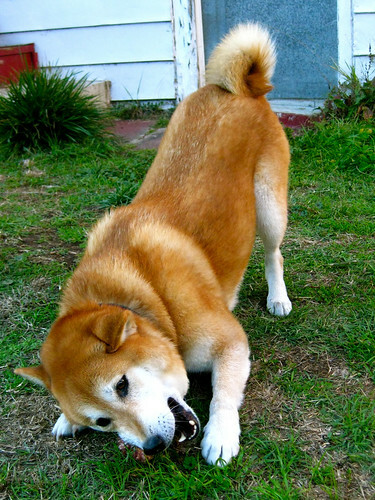 “It’s the only thing that’ll get my dog to listen.” Apparently, it was enough to make even my Shiba, who is typically much more reserved around strangers, heel at his side. So I let him give Bowdu a piece, got the name of the product from him, and made a mental note to check it out. Photo taken 18 November 2010. This Bow is easily motivated by food. * Variety is essential. We all thrive when we’re not eating the same thing every day. * Investing a little more (time, money) in basic needs (such as food!) will stave off long-term problems. Okay, admittedly, that last bit is hokey. What I’m saying is that we were ready to give this brand another attempt as more “experienced” consumers now, perhaps with more mature, discriminating tastes. 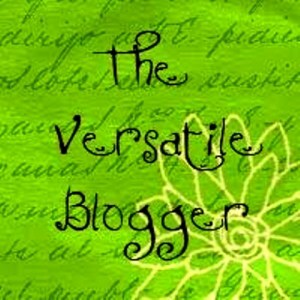 So we applied to be a part of Freshpet’s Blogger Program [EDIT: Program no longer seems to available! ], and we’re pleased to have this opportunity to provide our honest thoughts. A few weeks ago, The House of Two Bows received an overnighted box of goodies to review. We welcomed the case with a happy little schwag dance, and immediately began plotting out a feeding schedule to sample as much as we could while maintaining a reasonable deadline. Over the course of the next few weeks, we continued to feed the Two Bows their regular meals of kibble in the morning. In the evening, we would dole out a variety of surprise meals. The Two Bows have hardy appetites and tough stomachs, given that they’ve adapted to a 30 ~ 50% raw diet. But for ease of transition, we usually mixed in a little bit of canned pumpkin or sweet potato and sprinkled some Acidophilus over their meals, particularly when we were switching between products. 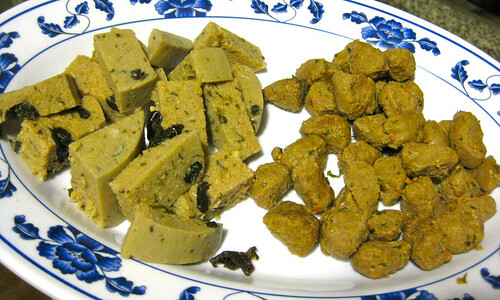 I also preferred to “cut” the Vital meat rolls with some non-meaty bulk, since the high meat content in those recipes (80-90%, depending on the recipe) is somewhat atypical of the Bows usual diets. 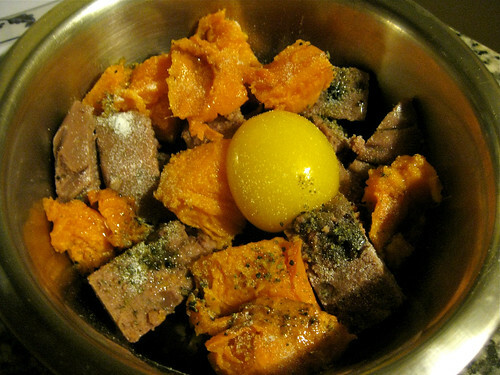 So Bowdu’s bowl above, for example, contains four ounces of chopped up Vital turkey meat roll, about one ounce of potato, and an extra raw egg yolk on top (that last bit is an occasional, not daily part of their diets). 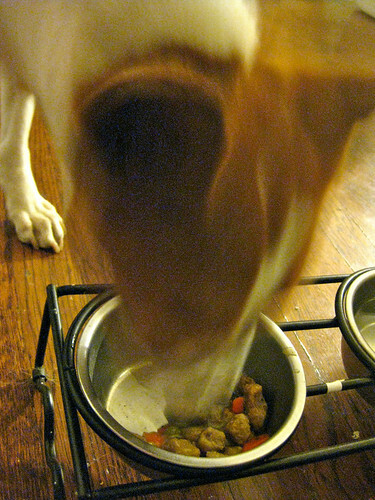 Even when they get raw meaty bones, I usually give them a small side dish of veggies because the Bows actually seem to like and want non-meat content in their meals, especially Bowdu. Those who feed a true prey model raw diet may be more amenable to these high protein, grain-free recipes, but for me, it was something to offset. I usually took the extra step of warming up the food for about 30-40 seconds in the microwave, though this step is not necessary and in some cases even inadvisable, as the liver “pockets” in most of the meat roll recipes would start to liquefy if heated too long. But somehow, the idea of a cold meal coming straight out of the fridge is a little sad to me… I prefer to serve my meals with a little more heart, though as the Doggy Daddy pointed out, it really doesn’t matter to them. Every meal was consumed with gusto, regardless of temperature. 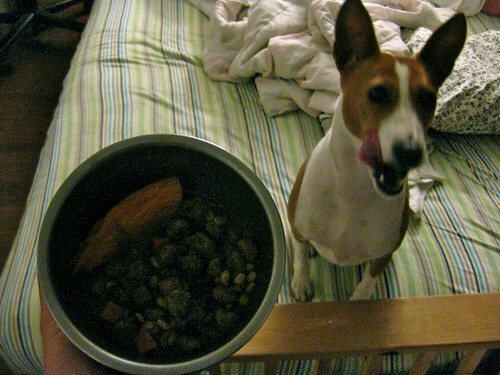 In general, we prefer grain-free recipes (with the exception of the dog congee that I sometimes cook for the Bows). 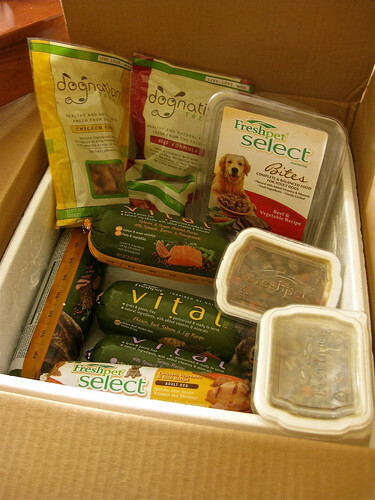 Some of the Freshpet Select items do contain a minimal amount of grain, specifically brown rice or barley. Those were delegated exclusively to Bowpi, since she doesn’t seem to exhibit any food sensitivities, just meat preferences. And no doubt about it, she was happy to slurp up each meal, especially the Homestyle recipes with extra gravy. In fact, she was so enthusiastic that it was hard to get a good picture of her consuming anything — she just came out a dimly-lit blur each time. She doesn’t need to see what’s in the bowl to be ready to EAT! The Freshpet Select Homestyle lines work pretty well for Bowpi, given their high moisture content and the fact that she doesn’t tend to drink very much water, except on hot days. I have to admit that even the Slice & Serve chicken roll smelled pretty appealing to my human senses; I sampled a nibble, as well as a piece of the Vital turkey roll. 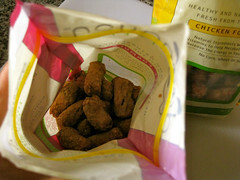 Suffice to say, they smell better than they taste to my human palate, but let’s be clear — this is dog food, after all. 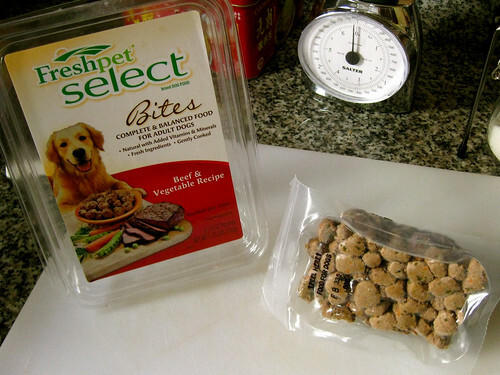 Freshpet stops short of claiming that the food is “human grade,” a label which you should regard with skepticism anyway coming from dog food manufacturers. Instead, they say that “All of our poultry comes from Farmer’s Pride, a leading human poultry supplier. The poultry coming into our plant has been inspected by the USDA” (see FAQ). Not sure about their other meats and ingredients (which are “source[d] locally from the United States wherever possible”). The fact that they’ve offered some transparency and named some sources on their website is a step in the right direction, though I’d still like to see more details whenever possible (this goes for all commercial pet food companies). This leads me to my only real concern with this whole line of products, and why I must still hesitate to give them all my highest grade, despite the Bows’ obvious enthusiasm for their meals. While I love the fact that the Vital line, in particular, makes use of alternative proteins like turkey, fish, and bison (as opposed to the mainstays of chicken, beef, and lamb), I remain skeptical about the amount and source of liver to be found in all of their Vital formulas, except for the fish-based recipe. 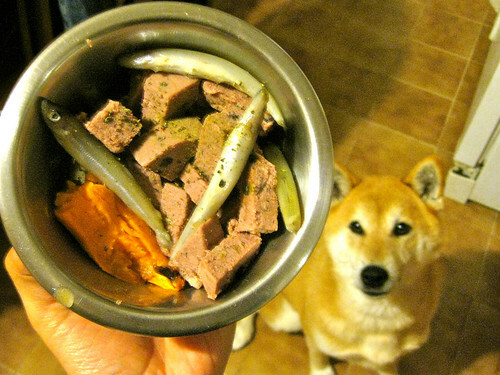 Sure, dogs love liver, because it is pungent and has a rich taste; it was that taste that clung to my tastebuds long after I had sampled that bite of turkey. 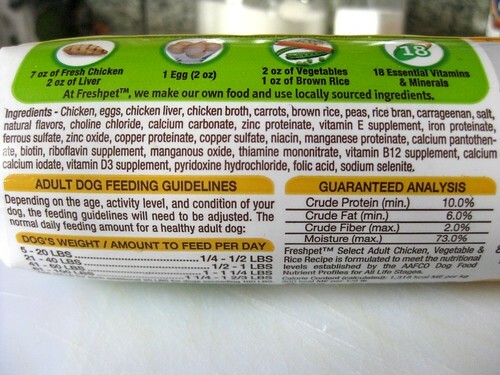 And it’s an organ rich in nutrients, a perfectly fine ingredient to include in moderation, though I do question the ratio given what is presented in the Fresh Pet Select chicken, vegetable and rice roll (see the summary blurbs below). In general, it’s one organ that I personally prefer to source from organic means, given that it is the major waste processor in the body and thus most susceptible to accumulated toxins. Again, their company FAQ is very upfront about the fact that their meats are not organic. Even though I’m not a stickler for eating only organic fare even in my own diet, I think it’s a cop-out to say that “Few, if any, pet foods are 100% organic.” In line with my own philosophies about maintaining variety, I remember that I have the option of not choosing commercial pet foods at all, and preparing my own 100% organic diet if that is important to me, as it is to many others. 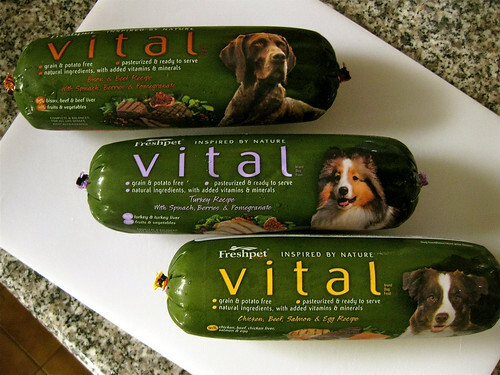 Given that criticism which is admittedly beyond the scope of this review and involves broader issues than I can hold Freshpet accountable for, I would concede that they’re doing pretty well compared to most other commercial dog food manufacturers. They’re manufacturing the kind of food that I would like to make for my Bows, if I had all the time in the world. 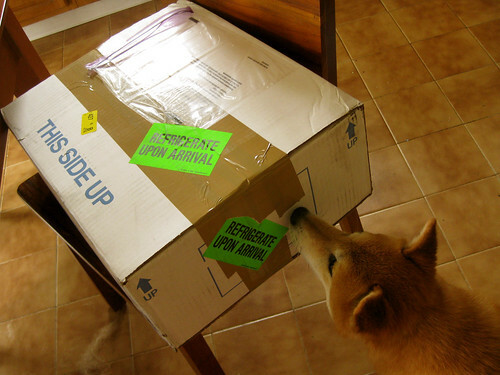 On that note, I do want to point out that they sponsor a research grant program through the Freshpet Foundation (can you spot the Shiba on the website?) 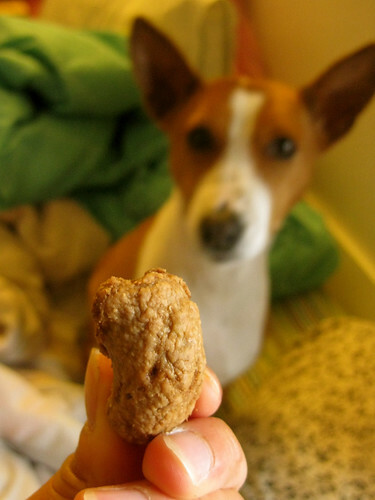 to promote research in pet nutrition. At a certain level of industry, corporate sponsorship is unavoidable, so it is refreshing to see a pet food company funding these kinds of initiatives with some degree of transparency and at least an expressed commitment to innovation sans politics. You can see exactly who is currently serving on the Grants Advisory Board, which supposedly “has full autonomy to evaluate and deploy grants to research deemed appropriate by the majority of members.” In August 2010, they awarded their first grant to a Cornell University-based veterinary oncologist to study the link between Vitamin D levels and canine osteosarcoma (bone cancer). Let’s hope this is just the first of many more grants to come. It makes the company look good. I took notice. And it all goes to give me some level of confidence in this company’s future, provided they’re able to maintain momentum. As it is, the company is fairly young, and different enough that distribution is probably a little tricky due to the unique storage requirements of their products. Manufactured without preservatives, they must stay refrigerated, which no doubt creates some costs and issues during transit, and also compels the company to install on-site refrigerators in order to convince stores to carry their item. Currently, I’ve only seen their products at my local PetCo and PetSmart (above), where the large refrigerator case looks, frankly, somewhat forlorn, given the emptiness relative to its bulk. Apparently, it’s also being distributed through select Krogers and Walmarts as well (not very common where I live). I’m almost certain that the smaller pet boutiques I frequent would not have the floor space for such a display, which is a pity because this is, in my opinion, a good quality food that would interest the growing population of dog foodies. With creative marketing, tenacity, and a commitment to nurturing potential customers through this kind of direct feedback (i.e., this Blogger Program that allows li’l ol’ me to write whatever I want about their products), I think this company has a healthy future. Ingredients: Packaging claims the recipe consists of 7 oz. fresh chicken, 2 oz. liver, 1 egg, 2 oz. of vegetables, 1 oz. brown rice, and 18 essential vitamins and minerals. Chicken, eggs, chicken liver, chicken broth, carrots, brown rice, peas, rice bran, carrageenan, salt, natural flavors, choline chloride, calcium carbonate, zinc proteinate, vitamin E supplement, iron proteinate, ferrous sulfate, zinc oxide, copper proteinate, copper sulfate, niacin, manganese proteinate, calcium pantothenate, biotin, riboflavin supplement, manganous oxide, thiamine mononitrate, vitamin B12 supplement, calcium iodate, vitamin D3 supplement, pyridoxine hydrochloride, folic acid, sodium selenite. Short blurb: Smelled the best to my human sense of smell, most cost efficient relative to quality. Amount of protein is actually much more significant when converted to dry matter percentages (I get 37% if I followed this correctly). I would get this again for Bowpi, and for her weight and diet, the 1-pound roll is just the right size. Ingredients: Salmon, ocean whitefish, spinach, blueberries, cranberries, pomegranate, Vitamins & Minerals (Calcium Sulfate, Dicalcium Phosphate, Potassium Chloride, Iron Proteinate, Choline Chloride, Zinc Proteinate, Tricalcium Phosphate, Vitamin E Supplement, Manganese Proteinate, Copper Proteinate, Vitamin B12 Supplement, Niacin, Calcium Pantothenate, Biotin, Riboflavin, Thiamine Mononitrate, Vitamin D3 Supplement, Calcium Iodate, Pyridoxine Hydrochloride, Folic Acid, Sodium Selenite), Carrageenan, Natural Flavors, Broccoli, Inulin, Sunflower Oil, Green Tea Extract. Short blurb: My favorite of the Vital recipes based on ingredients, though it does seem richer (oilier) than normal fare, perhaps because of the protein. 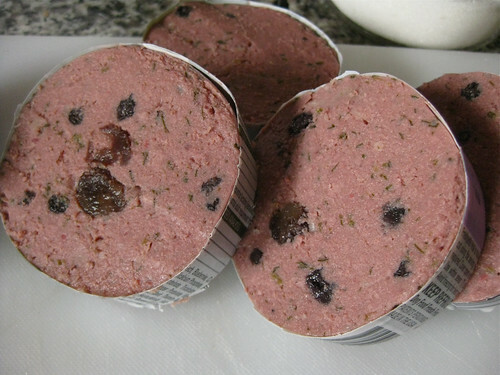 Ingredients: [Turkey recipe] Turkey, turkey liver, spinach, blueberries, cranberries, pomegranate, carrageenan, natural flavors, broccoli, inulin, flaxseed oil, green tea extract, choline chloride, vitamin E supplement, vitamin B12 supplement, niacin, calcium pantothenate, biotin, riboflavin, thiamine mononitrate, vitamin D3 supplement, pyridoxine hydrochloride, folic acid, calcium Sulfate, dicalcium phosphate, potassium chloride, iron proteinate, zinc proteinate, tricalcium phosphate, manganese proteinate, copper proteinate, calcium iodate, sodium selenite. Short blurb: The other recipes don’t differ substantially from the above, except for the Chicken, Beef, Salmon & Egg recipe which has the highest protein content of all. All seem to contain high quality ingredients, though they do seem a bit greasy and again, I am a little leery about the source of some of the liver meat, more so for ungulates than poultry. They’re also pushing my price-per-meal limits here, and it’s a concern with these proteins because there are comparable options available elsewhere, whereas there are fewer completely fish-based foods for dogs. Blurb: Bowpi was visibly less into this one, though Bowdu stole and gorged himself on the rest of an ENTIRE POUCH the first night I fed this (he ate enough for a 60 pound dog). I guess the product was tempting enough to bait Bowdu into breaking the rules, as he has NEVER counter-surfed like this before! Needless to say, his poops were gloriously messy for the next day or so. I should not judge this product based on Bowdu’s aberrant experience, but Bowpi was also noticeably gassier after eating this one. Combined with the clumsy packaging (bulky and not resealable), relatively unappetizing appearance of the contents, and more grain (though they’re still pretty high quality grains), this was our least favorite meal of the lot. 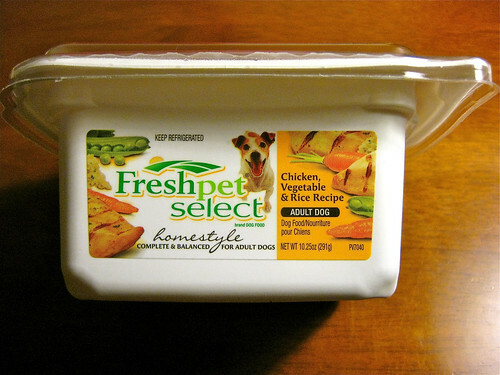 This was also the first (and only) Freshpet / Deli Fresh product that we’ve ever tried prior to this trial, the same product mentioned in my prefatory anecdote. Blurb: Again, great ingredients and unlike the Deli Bites above, comes in functional packaging. I could scoop out a fair portion for Bowpi’s meal, and leave the rest in the lidded container to be finished later. 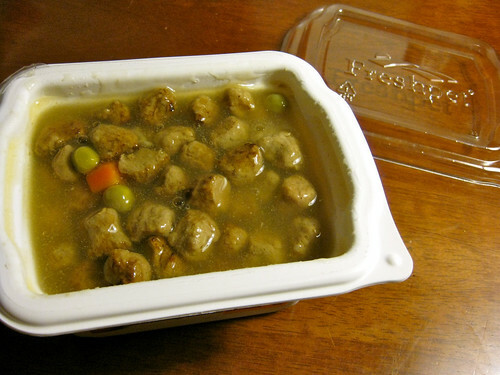 This seemed to be Bowpi’s favorite, and I was happy to give it to her for additional moisture, but given that this does consist of a lot of gravy, I wonder about its value relative to quantity. Bowpi preferred the chicken to the lamb recipe. Ingredients: [Chicken] Chicken, ground oats, chicken broth, salt, natural flavors, niacin, riboflavin, thiamine mononitrate, Vitamin B12 supplement. 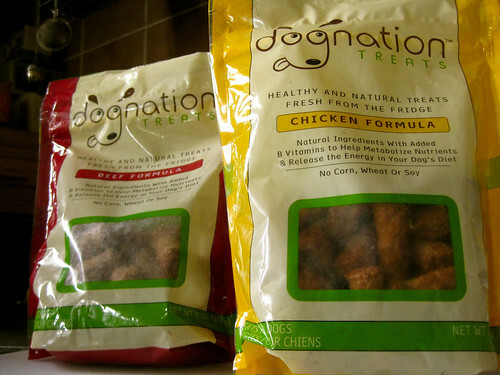 Blurb: We made the least use of these treats, as it often slipped our mind to reach into the refrigerator, pull out and unzip the pouch, and fish out one of the cold meat nuggets to treat the dogs. They were always interested, but I don’t think these treats ultimately do much to inspire them to “Live, Love, Wag,” as the product’s motto goes. Besides, they’re a little greasy, as evidenced by the film on the packaging window above. All of this doesn’t make for a particularly convenient treat, especially as they recommend returning the treats to the fridge within 20 minutes. We did try to use them as pill pockets with mediocre success. The inside is drier than it appears, so it’ll crumble if you try to stuff too much in the center. On the other hand, your dog will probably be too interested to care, unless it falls apart before you can get the pill down his throat. Short shelf life — most items need to be consumed within 7-10 days after opening. Price — keeping a large adult dog on this diet would be difficult! Liver content means I would not recommend this for exclusive feeding. 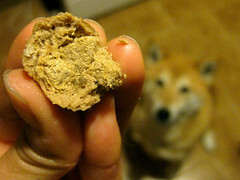 Soft texture may provide fewer dental benefits for dogs that need it (and mine do). Currently, limited distribution at the local level — honestly, I prefer to shop at independently-owned pet stores than national chains. COMPANY INFORMATION: Freshpet®; P.O. Box 2157; Secaucus, NJ 07096-2157; The company maintains “strategic alliances” with Tyson Foods, which enable its distribution. * All prices based on one of my local pet store’s pricing scheme. Prices may vary in your area. 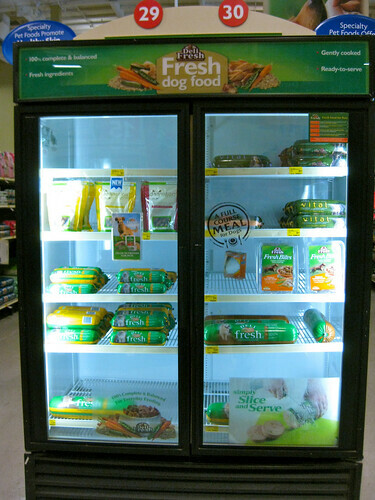 EDIT 12 April 2011: Freshpet foods are not frozen before shipment, though they say it’s okay for you to freeze them. I would not recommend doing this, or at least not the way I did it. That is, I cut up the appropriate portions of the rolls beforehand and placed about 3 days’ worth in separate Ziplock bags. Perhaps because of the high moisture content of the rolls, the freezing process ended up “squeezing” much of the moisture out of the food, so that when they thawed, the juices pooled in the bag, making it a little messier. Freezing the pieces also changed the texture of the product, so it was a little “spongier” and more porous, less dense in feel. 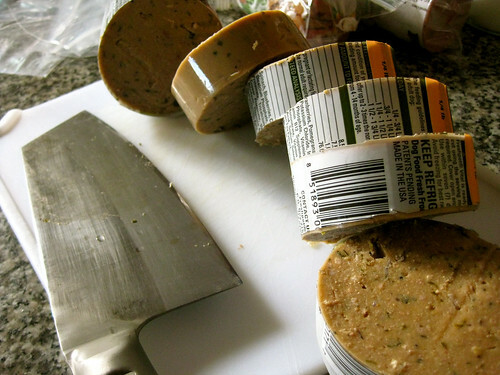 The rolls are probably best when you can finish it all before it goes bad, without having to freeze it, so this is something to keep in mind before chopping up several different rolls at a time. 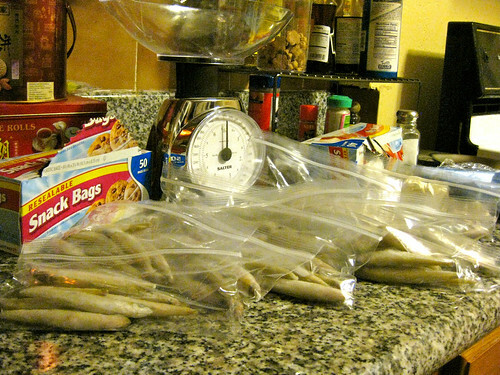 I had bought a whole tray of frozen smelt and separated the pencil sticks into two ounce portions to be added to the dogs’ meals as a supplement. So the other night, I added a few slivers to Bowdu’s 4 oz. portion of Vital Turkey dinner, along with a side of sweet potato, as an approximation of the Primal Raw Turkey & Sardine formula he usually gets. Well, he wolfed down everything… except for the smelt. Each piece was left intact on the floor right next to his clean-licked bowl. By my memory, this is the only meat he’s ever outright rejected. I’m going to defer to Bowdu’s judgment on this one and discard the rest of the smelt. It’s not a type of fish that I would choose to eat, so why force it on the dogs if they’re clearly not into it? Less words, more visuals for the remainder of the week. What type of food do you feed? Hmm, I can make polls! 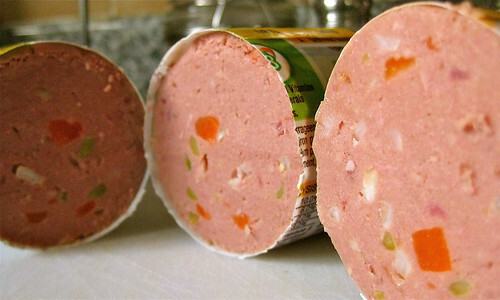 I thought about this as I was slicing up portions of pre-cooked rolls from Freshpet Select, and how this is a novel food type for us. It’s somewhere between canned food (which we don’t feed) and unrefrigerated rolls (like Natural Balance) which we just started experimenting with a couple months ago. One big difference, however, is that these rolls must be kept refrigerated at all times. Since Freshpet hooked us up, well… let’s just say refrigerator space is at a premium until the two Bows plug through this stash! A more thorough review is forthcoming, but I anticipate having a lot of positive things to say. While the Bows don’t have any appetite issues, they’ve definitely glommed onto the fact that this is something different than their usual fare. However, I’m still breaking up this feeding trial with raw meaty bones and extra dental chews, because every item in the line is relatively soft, which doesn’t do a whole lot for their teeth. The Bows leapt off the futon on high alert mode the moment that our FedEx deliverywoman tromped up the front porch with this huuuge box. Somehow, they KNEW it was for them. All will be revealed in good time. As a hint, its contents will be consumed, digested, and converted into our first “sponsored” review, courtesy of Freshpet‘s Blogger Program.